Medium Black Cart #3070829 for 1911 Black & Chrome 8 Ounce PopperFor added convenience and a stream-lined complete look for your Paragon machine, be sure to add a commercial cart! Perfect for a concession stand, an event or even in your home, this professional cart is specifically made to fit and size and design of your Paragon machine. The powder coat finish is a perfect match to your Paragon machine's paint. Manufactured completely of steel, the cart is durable and has a storage area with two shelves for storage of supplies and the commercial wheels allows for greater mobility. 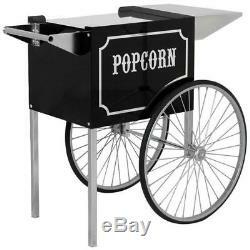 Model: Medium Black & Chrome Popcorn Cart for 6 & 8 Ounce PoppersPart#: 3070820Ideal Machines: 1108820Actual Dimensions WxDxH: 22 x 29.5 x 33Shipping Dimensions 25 x 25 x 26Ship Wt. Key FeaturesIntegrated supplies storage in backLarge area for custom artworkCommercial grade steel constructionEasier access than the pedestal standGreater mobility and extra convenienceMore visible for impulse sales and merchandisingChip resistant coatingOne year warrantyMade in USA. The item "Paragon Medium Black & Chrome Cart for 6/ 8 oz. 1911 Popcorn Machines" is in sale since Wednesday, March 14, 2018. This item is in the category "Home & Garden\Kitchen, Dining & Bar\Small Kitchen Appliances\Popcorn Makers". The seller is "concessionsdirect" and is located in Urbandale, Iowa. This item can be shipped to United States.